If you’re used to org charts of business with the owners at the top and building down with employees till you reach the bottom where the customers reside, think again. The customers are, or should be, at the top of the chart. Each piece of the design should be geared to focus on those people who pay the bills and keep the company ... See More in business – the customers. That is, according to Tom McCormick, our guest this week. Tom McCormick of North Liberty IN Started McCormick Electrical Services in 1999 with $4000 and a 1979 van. He started out doing all types of electrical work until about 2004 when the economy was shifting and he realized realized that not having a sharp focus yes had kept him busy and growing but not profitable.like he would like. With help and encouragement from friends and fellow organizations Tom focused more working on his business than in his business. McCormick Electrical changed focus to primarily a Residential Electrical Service Company instead of a do all electrical company. Focusing on clients themselves not just the problem at hand and treating clients as he would want his own family treated and cared for. McCormick will close 2018 at just under 1 mil in sales with a goal for 2019 of 1.5mil He attributes his success to his wonderful team of people, their supportive families and their wonderful clients. 3.Customer service is so important and you should always strive to do your very best. When given lemons, you should always strive to give the customer back a lemon pie but at least give them some lemonade. 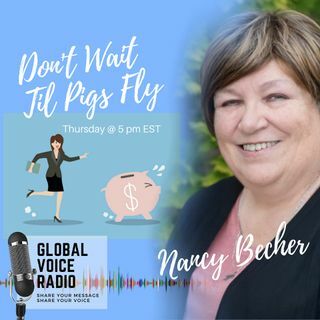 As always, you can reach me at: nancy@don’twaittilpigsfly.com; www.facebook.com/bsuflyingpigs; www.linkedin.com/in/smallbizjunkie or call me at 269-319-6041. Please comment on the podcast below with questions, thoughts, ideas for future shows, and more. Download, subscribe and share with others so that we can continue to provide high quality resources for our listeners. Until next time, Don’t Wait Til Pigs Fly, but get out there, do your thing and Soar HIGHER!